Not that many years ago, big, colorful vehicles roamed the streets of St. Louis. They helped build our city—and our suburbs, and helped to build the style of life we live to this day. Today the memory of those trolley cars fades and the myths about them multiply. Not for long. Streetcars are experiencing a dramatic comeback all over our country, and a new line is planned for Delmar and DeBaliviere in Univerity City and western St. Louis. There are extraordinarily good reasons to bring back streetcars. Hopefully this text will dispel some of the myths and answer the questions which many people are asking. In their heyday, streetcars did much more than just provide transportation. That they did very efficiently. They also carried the mail allowing people to communicate faster before telephones and the internet. Before air conditioning they let people take cooling evening rides. Before television they let people attend all sorts of entertainments, such as amusement parks, skating rinks, movies, world's fairs, and more. Trolley crews often were neighbors who provided a sort of neighborhood watch, especially keeping an eye on children, who had much greater access to streets. Streetcars made large downtown stores and offices possible. They also opened up the suburbs. There were party cars and funeral cars. Streetcars took you to church, to visit grandma, to work, to shop, to social gatherings and home again. Since the last streetcars disappeared here in 1966, perhaps a good starting p1ace is some terminology. A streetcar is an urban rail vehicle which usually runs in city streets or near them in medians, etc. Horse cars, cable cars (à la San Francisco) and trolley cars are all streetcars. Trolley cars are electric streetcars. Light rail vehicles are, more or less, trolley cars, all grown up and with a modern name. The Delmar Loop district is a vibrant, vital area of unique shops, restaurants and entertainment venues. It is near Washington University and abounds with students. University City is a high density residential area with large beautiful homes and with a great many distinctive apartment buildings. 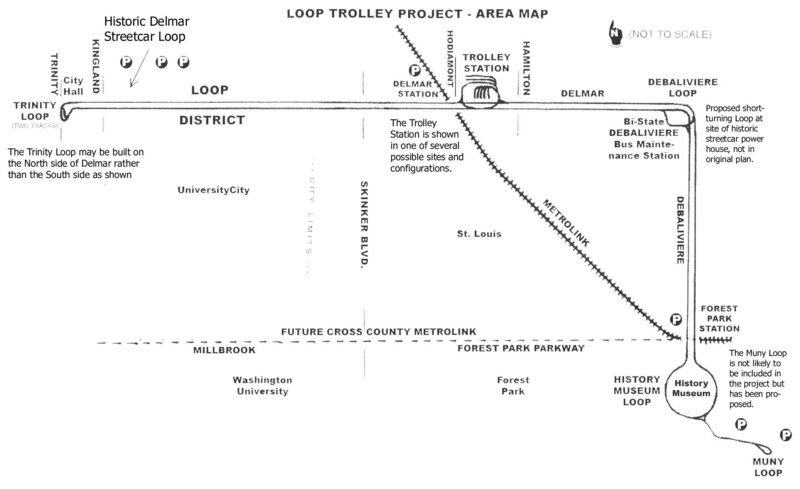 The Loop District, which took its name from the streetcars which used to turn around there (10-Delmar, 05-Creve Coeur), however, is not without problems. Traffic is dense, slow and irritating. Parking is sometimes impossible. The district is also bursting at the seams, needing an appropriate way to expand. One of the major reasons to bring streetcars to this area is the mitigation of both traffic and parking problems. Because the streetcars will link the Loop District with the Delmar MetroLink station, the area will effectively pick up thousands of free parking spaces—those at MetroLink’s park-n-ride lots. As St. Louisans have already demonstrated, they will leave their autos behind when comfortable, convenient transport is available. It is anticipated that thousands of people will park their cars and use the combination of MetroLink and the new trolley line to access the loop. Just east of University City, in western St. Louis, Delmar enters an area that is somewhat blighted. These blocks are ideal for loop expansion so another of the things the new line is expected to do is attract economic development to this area. In other cities new trolleys have done exactly this. Developers recognize that new infrastructure required for the streetcars is a major community investment and commitment, and they literally jump at chances to invest in such areas. In Portland, for instance, where a new streetcar line began running in 2002, there are already $18 dollars of new investment along the trolley’s route for each $1 of public investment in the streetcar line. Our entire region will see other benefits. For instance, the ability of a streetcar line to attract tourists is simply amazing. Kenosha, Wisconsin opened a new trolley line in 2001, and within a year it was the number one tourist attraction in its county. San Francisco has attracted billions of tourist dollars with its streetcars, both trolley car and cable car and is today expanding their trolley system, buying vintage cars everywhere they can. After MetroLink opened, the East-West Gateway Coordinating Council began looking for ideas to improve the neighborhood around Delmar station and more conveniently link it with the Delmar Loop District. At that point Joe Edwards, whose reputation of helping the Loop District to revive and thrive is remarkable, conceived the idea of the streetcar line. A few years ago Bi-State Development Agency, our community transit operator now called METRO, was persuaded to do a feasibility study to see if the trolley idea had merit. Two years and $200,000 later, the study came back—a streetcar line would indeed be feasible and is likely to directly improve traffic and parking in the loop, is likely to be a catalyst for economic development in the blighted area, and is likely to be a very big success with tourists. Bi-State put their stamp of approval on the plan, but said they didn’t have the money to build the line and turned to project over to Citizens for Modern Transit, the transit lobbyists group whose campaign for MetroLink got it built. After many planning sessions with community leaders, streetcar experts and others, CMT created a new “entity” to get the job done, the Loop Trolley Company. Joe Edwards, due to his reputation for getting things done, was asked to be its president. Loop Trolley has been working ever since to bring all the pieces together and make it happen. Here's the plan. The new Loop Trolley line will have a route just over two miles long. It will consist mostly of double track in the street and will start in front of the University City Hall at Trinity and Delmar. From there it will proceed east through the Loop District, serve the Delmar MetroLiilk Station, continue east to DeBaliviere and then turn south. It will run on to the Forest Park MetroLink station, cross the Parkway and Lindell Blvd, enter Forest Park and make a wide loop around the History Museum. This line will be a real streetcar line, not little buses in trolley disguise. It will have real tracks and real overhead wire for power. The cars will most likely be a combination of brand new streetcars built just for this service; cars with air conditioning, wheel chair lifts and thoroughly modern motors, controllers, brakes, and other equipment, but the look will be built to actual streetcar designs from the turn of the last century. Some will be actual vintage cars which have been painstakingly restored. The fleet will probably consist of 8 cars which will run seven days a week, providing very real transportation service for the area. Cars will ply the streets every fifteen minutes during heavy periods, less at slow times. Crews will be a combination of volunteer workers and paid staff. All will be thoroughly trained. The new streetcar line, which will be a real trolley line using modern methods and materials but using vintage and replica streetcars, will begin in front of the University City Hall. A small loop with a layover track will allow cars to turn around here. This portion of the line consists of large, historic buildings, such as University City’s city hall building, the library, several churches, the Lion Gates, the St. Louis Symphony School of Music, CASA. The last two are large concert halls/theaters which often attract performances at the same time and which can attract 1500 or more people for those performances. Parking is at a premium, especially when both major venues have performances on the same evenings. This section contained the “old” Delmar Loop which gave the district its name. The entire district to Skinker is a vibrant area of restaurants, unique shops, arts and entertainment venues, professional offices and much more. It is a heavily populated area with dense housing, condos, and apartments. Washington University is to the immediate south and the area literally “crawls” with college students. Sidewalk cafes abound and the street scene is robust and “electric.” There is much historic restoration including the beautiful Tivoli Theater. This stretch of Delmar is plagued with heavy, clogged traffic and has a definite parking shortage. Until recently considered blighted, this portion of Delmar is now marked by major new construction and restoration. The new Pageant (3500 seats) live concert theater is one of the most popular in the entire Midwest. This area is rapidly providing space vitally needed for “loop district” expansion. New shops and offices are filling in between long existing businesses and the area is definitely looking up but additional economic stimulus is highly desirable. Now blighted but improving, the new trolley line is expected to be a major catalyst for the continued economic development of this area, a nicely rehabbed neighborhood of residences, apartments, small businesses, restaurants, and more. Again, an economic catalyst would be welcome in this area. Additionally, convenient transportation to the Loop area and to Forest Park will be a boon to the residents of this beautiful neighborhood. St. Louis’ extremely well liked light rail system serves about 55,000 riders per day. Delmar Station is a major station about midway from Lambert International Airport and downtown St. Louis. The line continues across the Mississippi for another 21 miles to Scott AFB/Shiloh. The new trolley will provide a convenient, safe, comfortable link between MetroLink and the Loop District. The Forest Park Station now serves the original MetroLink line but will soon also be the “first” stop new Cross County Line which is now under construction. The new line will link Clayton and, Shrewsbury and other county communities with MetroLink, downtown, Illinois, the Airport and more. The new trolley line will also link these areas to Forest Park and to the Loop District. The Missouri Historical Society Museum is a multimillion dollar major traffic generator within walking distance of Muny, a popular summer theater with 12,000 seats. It is also the gateway to Forest Park, one of the largest urban parks in America and full of attractions and institutions such as the Zoo. The new streetcar line will follow the new circular road around the museum's new expansion area, forming a loop and the end of the line. A separate proposal suggests a single track extension from this loop to the area near the bandstand in front of Muny, allowing easy access during their season, but this proposal has not been included in plans at this time. That is the new line in a nutshell. But there is much yet to tell. Here is a minor discussion of some of the benefits you can expect if the line is built. Starting in the Trinity Loop area, two major entertainment venues generate a great deal of traffic—and parking problems. The Loop Trolley will allow people to park anywhere in the district or at any MetroLink Park and Ride lot, thus making their evening more pleasant and reducing both traffic and parking congestion. Likewise, MetroLink's thousands of parking spaces become Loop District parking spaces when people leave their cars and enjoy the area’s restaurants, theaters and more. St. Louisans have already demonstrated their willingness to do this provided MetroLink is going their way. The trolley will simply be a new “arm” for MetroLink, extending its reach. Not just those using it will benefit. Every car left behind reduces both street congestion and parking. One more reason this line is important is its ability to attract economic development money to those areas along the route which need it. Developers love real streetcar lines as the infrastructure is proof to them that the community has committed itself to long range development. Real streetcars are money magnets which other cities have discovered bring serious recovery to blighted neighborhoods, attract new businesses and create new jobs and tax revenue. Everyone benefits as schools, zoos, streets, etc., all have more. Streetcars are not just transportation, they are tourist attractions. Money flows into areas with real streetcars as tourists flock to the areas they serve. Trolleys are currently attracting hundreds of millions of tourism dollars across the nation. The new line here will help St. Louis receive its share. No track will be laid in the streets until the new Cross County MetroLink line opens in 2005. Construction of the light-rail has several major streets closed and the Loop Trolley Company does not wish to interfere with the detoured traffic and make the problem worse. Additionally, not all of the necessary money is in place, so the project may start even later than 2005 while the finances are accumulated. All signs are that the new streetcar line will accomplish all that its planners claim, and then some. In other cities trolleys are making a real come back and doing just the things that are hoped for this line. For instance in Memphis, after their first new streetcar line was built several years ago, the community was so happy, they built a second new line. Today their third streetcar line is ready to open. In the areas the first two lines run, the trolley cars have been a money magnet, drawing investment along their routes and causing the neighborhood to go from “tentative” to “trendy.” Tourist dollars are way up. So are restoration and new construction projects, jobs, and tax revenue. Tampa opened a new line in 2003, but found that long before the line was ready to run, anticipated economic development of the area was advancing at a pace much greater than expected. Ridership is also much greater than predicted and the line is making a profit. There are similar success stories all over the U.S. Many people today believe that streetcars disappeared from America because they were slow, noisy and did not do a good job. Nothing could be further than the truth. There is a demonstration streetcar line at the Museum of Transportation in Kirkwood which anyone may ride on weekends from April through October. One ride on the modern (1947) “streamliner” streetcar will prove the cars had plenty of power and speed. For safety reasons, the car is never run very fast, but amongst passengers the most common exclamation heard as the car starts up is "Wow—feel that power." Streetcars died in most cities for a combination of reasons, mostly stupidity! For instance, streetcars were asked to do much more than just pay for themselves. In St. Louis, the city taxed the tracks, the cars, the overhead, the power plants, each passenger, and overall income. The trolley company was also required to pave the streets in which they ran as well as clear those streets of snow, keep them clean and water them in the summer to keep dust down. All those costs killed streetcars, because buses had no such requirements, the companies switched. Europe did not abandon trolleys (what they usually call trams) but kept up research and improvements. America threw away the technology, but in Europe development continued. Today state-of-the-art cars wisk crowds around big cities with ease and in comfort. We are just now starting to realize the folly of the 1950s and rebuild what we once had—great, modern, fast, nonpolluting, comfortable, inexpensive transportation. Trolleys To Go is a nonprofit Missouri membership organization providing grass roots support for the Loop trolley project. The Loop Trolley Company, also nonprofit, will be the actual builder and operator of the project. The Loop Trolley Company is a subsidiary of Citizens for Modem Transit (CMT) another nonprofit corporation. The details appearing in this brochure are from various sources and there are likely to be differences as the project is engineered and constructed. Remember, nothing is definite until the “final engineering” is complete and the contractor has built it. Some of the features on this map are proposed but not found in the feasibility study completed for the Bi-State Development Agency (Metro) in 2002. As the plan matures, you will be able to stay updated on the Trolleys To Go web site: www.TrolleysToGo.org. Trolleys To Go does not represent or speak for either The Loop Trolley Company nor Citizens for Modem Transit but we do support both organizations efforts to bring streetcars back to this area. We sincerely hope that you will join Trolleys To Go in our effort to help bring streetcars back to St. Louis.